Venture capital is still pouring into the energy storage industry. Where is the exit for startups? Our tireless smart grid analysts found an SEC filing yesterday revealing that battery-maker Aquion just closed another $25 million in VC funding. We've asked the company for a comment. In January of this year, Aquion closed a $55 million Round D to push along its manufacturing and commercial deployment. Investors in Aquion include Bill Gates, Yung’s Enterprise, Nick and Joby Pritzker (through their family’s firm Tao Invest), Bright Capital, Gentry Venture Partners, Kleiner Perkins Caufield & Byers, Foundation Capital, and Advanced Technology Ventures. Trinity Capital Investment and CapX Partners recently added $20 million in venture debt, bringing Aquion's equity, debt and grant total to more than $145 million. Aquion also recently added Tom McDaniel, former CFO at Edison International, to its board of directors. 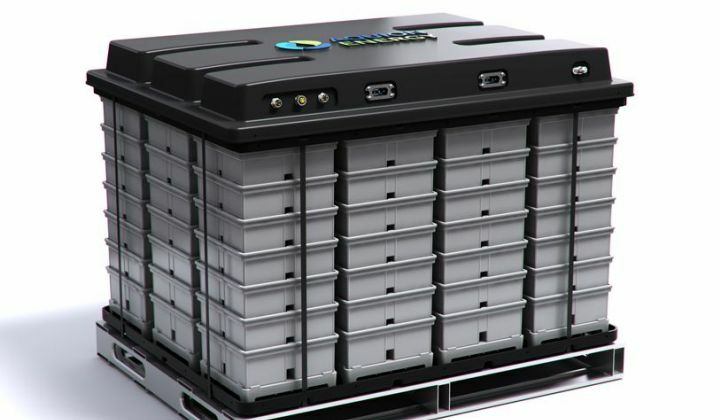 Aquion Energy says its sodium-ion battery technology can deliver round-trip energy efficiency of 85 percent, a ten-year, 5,000-plus-cycle lifespan, energy storage capacity optimized to charge and discharge for multi-hour applications, and perhaps most notably, a price point of $250 per kilowatt-hour -- much lower than the $500-and-up per kilowatt-hour of today’s competing technologies.